Back in 1818 when Mary Shelley first created Frankenstein she began a trend with authors of Science fiction and horror, revolving around a man vs a monster. Some things man was not meant to mess with is a good way to describe are inability to play god in a lot of films and books. This would be known as fringe science. Science that cant be explained or science that is being messed with. Cloning is a good example of real life Fringe Science. It seems as though Man has a god complex and strives to make things better with life but ends up screwing everything up and getting a lot of people killed. In other cases they mess with chemicals to help those who may be sick hurt or even dead. 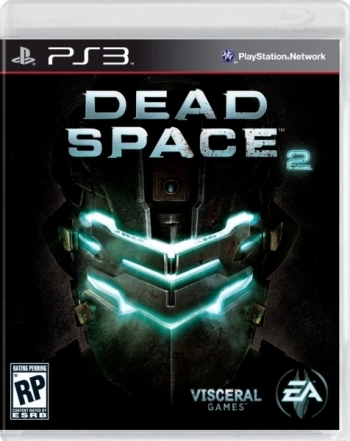 Recently in the movie Splice two scientists try to come up with a way to cure a bunch of disease. The company that owns their research wants to just make a buck, so they decide to make their own test subject to show the world what they can do. Unfortunately things get out of hand and people die. One film after another we see the road of good intentions paved with blood. In this article we will go over ten best examples of Man (or Woman ) messing with stuff they really have no business playing with. You could almost say these are the Smartest Dumb people you will ever meet. 10. Deep Blue Sea– A scientist tries to cure Alzheimer using Shark DNA the only problem she makes the Shark super intelligent. A good thought process but she should not have poked around a sharks brain too much. 9. Return of the Living Dead Part3 Living Dead Girl—A boy and a girl are out joy riding when they get into a terrible car accident. The boyfriend remembers his father works at a government lab with some weird material that can reanimate the dead. 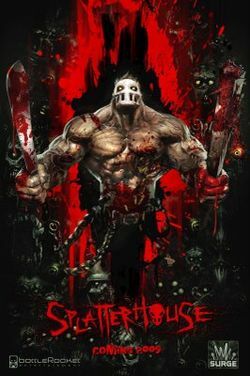 Problem is now that his girl is back Goth and Hott she also wants BRAINS. Love is tragic in this case tragic for the human race. 8.Species— Lets mix unknown Alien DNA and Human DNA together what do we get the hottest sexiest Alien ever made. Problem is she wants to mate by the time she reaches Adult hood. Good idea but they should have watched Weird Science when it comes to making the perfect woman. Best part of the film is Alien designer HR Giger created Sil. 7. 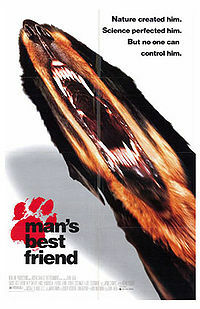 Mans Best Friends–Make the Best dog money can build just make sure it’s not more insane than CUJO. This puppy goes from sweet and innocent to vicious and evil. the only person it seems to not want to kill is the blind woman who adopts it while the military is hunting it. Love is blind!!! 6. The Fly(86 )— A scientist tries to create a matter transporter it works only problem is he forgot to check the tube when he teleported to make sure he was alone . This is more of a man becoming the monster but still messing in science he shouldnt. 5. 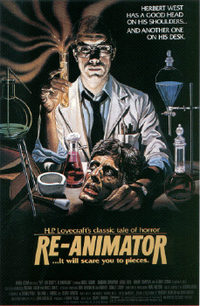 Re-Animator –Scientist Herbert West comes up with a special green serum to bring the dead back to life and to keep them living. He believes this will make him understand what death is like and how he can control it. Only problem is it makes them stark raving mad and crazy and all they want to do is kill and destroy. This scientist never watched a zombie movie. 4.Jurassic Park— Billionaire John Hammond clones Dino DNA and repopulate the species to show the world what these amazing creatures used to look like. He builds a park and forgets that Dinosaurs where the most powerful creatures ever created by GOD. Man had no business in trying to play god. Best summary of this whole movie God creates Dinosaur, God destroys Dinosaur, God Creates Man, Man Destroys God, Man recreates Dinosaur, Dinosaur eats Man, Woman inherits the Earth. 3. 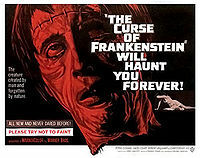 The Curse of Frankenstein–The Hammer films version of the Frankenstein story has Victor and his friend Krempe bring a dead dog back to life. Frankenstein suggests that now they must create life from scratch, but Krempe withdraws when Frankenstein suggests using human body-parts. Victor Frankenstein does eventually create a body utilising a corpse found swinging on a gallows, and hands and eyes purchased from charnel house workers. Next, he seeks the brain of a distinguished professor. this way his creation is smart, but it still hates its existence and want nothing more than to destroy and kill. The professors brain he uses wants nothing to do with its new horrible life. Victor had good intentions but went about them all the wrong way just to prove he could make life from scratch. 2.Bride of Frankenstein–In order to give his creature a mate Victors Son creates a woman from scratch so his creature will not know the lonely ness he has felt thru the many years before he met his own wife. It works and he creates WOMAN but she is of course not given a sence of manners as the first site of her husband to be she hisses at him in disgust and the creature feels betrayed. 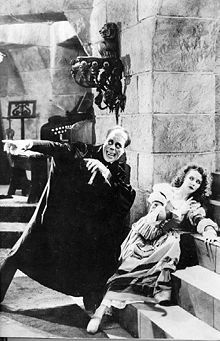 Frankenstein and his wife flee as the Creature kills both himself and his bride. Love Hurts!!! 1.Frankenstien— This is number one because it was the first film to show us how mad a scientist can be when he puts his mind to it. Victor Frankenstein decides he can create life from mitched matched parts. A man he can control. He had everything right about his project untill he decides to use the brain of a criminal. The creature wakes up angry frustrated and confused. It has no meaning of write or wrong. It grows to hate its master especially when victor tries to kill the creature. During the viewing of the god awfull Eclpise PA2 new trailer came out check it out. We can’t wait for this movie in Oct. In 1941 Lon Chaney Jr gave us the greatest werewolf story ever with the Wolfman. It was silver screen horror brought to life the likes of which we had never seen before. Over the years we had other wolf films but none were as spooky and gothic as the original. Over the past 10 years we have had to suffer thru bad remakes of great horror movies that over acted the parts the actors were in or they were more about appeasing a teen audience that could not appreciate the original. At last we have one that holds up to its counterpart. The Vampire genre has been revived and reviled countless times. But it always seemed as the Werewolf always got the Silver bullet. 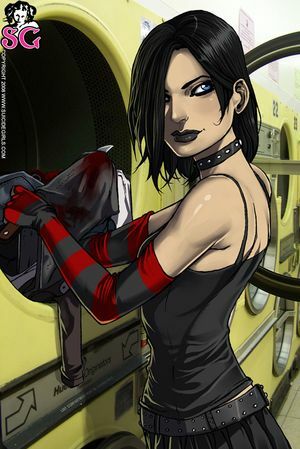 Underworld and Twilight tried but lets face it those were more about Vampires than Werewolves. 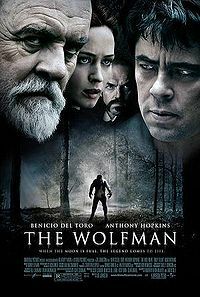 Benicio del Toro, Anthony Hopkins Emily Blunt and Hugo Weaving star in this gothic horror thrill ride. It sets the films back in the late 19th century. del Toro plays Larry Talbot but since it’s the 19th century he’s called his proper name Lawrence. 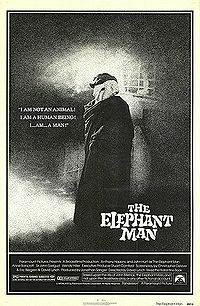 His father played by Anthony Hopkins summons him home to help find his missing brother. His brother was wed Emily Blunt’s character. Lawrence then finds out his brother was killed by a monster. While helping a local gypsy clan. His brother was friends with, he is bitten and will become a werewolf. Hugo Weaving, is the inspector on the case but he shows how useless he is right in the beginning when it’s mentioned he worked on the Jack the Ripper fiasco a few years ago. Don’t count on him being much help! Interesting is that Hugo plays the good guy in this film, when most of his roles (Transformers, The Matrix) he plays an A-hole villain. The cast is top-notch and it shows with their performance thru the film. The director Joe Johnston (Jurassic Park 3) really put a lot of detail into the film with the Wolf Cane and ring that Talbot has in his possession, are the same from the film years go. The makeup is fantastic since the same team worked on Jon Landis American Werewolf in London. 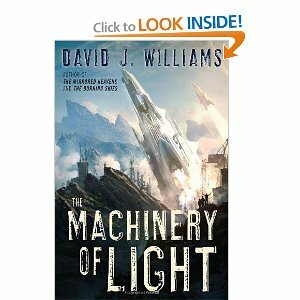 Tomorow David Williams will be on the show, a Sci-fi Author we had a chance to preview one of his books recently which is part of his Autumn Rain trilogy (after 2008’s The Mirrored Heavens and 2009’s The Burning Skies). his newst book is The Machinery of Light. He will be calling into the show at 1215am est. Next week me and Ryan will be going to RI to look in on the HP Lovecraft sites and The home of the first American Vampire.